Calculating social media ROI has been deemed as one of the tougher aspects of being a marketer. It’s not always the easiest to do because there are so many different meanings to what ROI may mean based on the type of conversion goals. 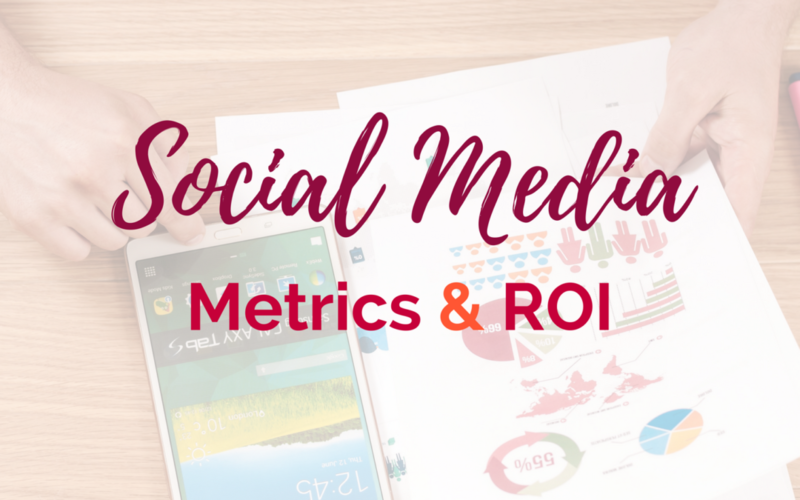 To simply put it—social media ROI is what you get back from all the time, effort, and resources you commit to social. This straightforward formula has just the two parts: Return and Investment. “Return” is one of the trickier elements of social media ROI because (as mentioned earlier) it can mean so many different things. First, you must determine: What do you want to achieve? Second: How much are these actions worth to you? Based on the resources you have, choose the goals you’re looking to achieve and track them. Pay-Per-Click (PPC) costs – How much would you end up paying if you were to use ads to achieve the same social media actions? The PPC costs seem particularly interesting to me. Basically, you compare the amount you would pay in advertising for a new follower, click, impression, etc. and anticipate what you actually earn via your organic (not paid) social media sharing. Your time or investment in a Social Media Strategist – Multiply labor-cost per hour by the number of hours committed over a given period (depending on whether you’re measuring social media ROI for the week the month, per campaign, etc.). Advertising spends – The amount you spend on social media advertising—boosting Facebook posts, promoting tweets, etc. The key is finding the right things to measure and ultimately report for your organization. When trying to figure out what those are, remember that you will have two kinds of data. Quantitative data is generally numeric in nature and can be used in true scientific analysis, with sample sizes of statistical significance and results that are repeatable. Followers/fans: This is one of the most common metrics we see brands track. Be sure you’re not placing too much weight on this one. It may be gratifying to see growth, but if it’s not tied to something more meaningful, it’s just a number. Engagement: An incredibly meaningful metric—perhaps one of the most important in measuring your own success and efforts—engagement can actually measure a host of different items depending on the channel. All of these different metrics combine to give you a sense for how well your audience is responding to your content. Timing: Take a look at the timing of your community’s activity as well as your own. You want to ensure you’re active when they are. This is often overlooked, as many accounts are only managed during business hours, but that isn’t always when your customers are listening. Click-through rate (CTR): Click through rate is a familiar metric for most Internet marketers, and it can be valuable in social as well—especially if one of your goals happens to be driving traffic back to your website. Think of it as a sort of social conversion that you can work to optimize. Qualitative data is based on observations, and it often takes the form of hypotheses that stem from smaller sample sizes than you’d normally need for a true scientific study. These hypotheses can then be tested using quantitative data. Influence: This one’s a bit controversial. Everyone wants to find their community’s influencers, but there is currently no universal standard for measuring influence or finding those people. There are several tools available that offer “influence scores.” Though if you choose to use such a tool, you should have a good sense for how it determines the score; you’ll want to ensure it aligns with what you are actually trying to measure. Sentiment: Sentiment analysis attempts to measure the tone and tenor of a conversation around a stated topic or item. In social media, this is largely used to tell if people love, can’t stand, or are neutral about your brand or campaigns. Most sentiment measurement tools are automated these days, and if you choose to go this route, you’ll want to make sure you understand the methodology behind the tool—particularly the margin of error—to help you understand the context of your reports. There are also manual sentiment analysis tools out there to use. However, there are many drawbacks to these including labor costs and your time. Not to mention that a really great manual solution may be much more expensive than an automated one. Conversation drivers: With the right tools, we can look at nearly any platform (or all of them for that matter) and see what people are talking about. When it comes to your brand, you’ll want to know the topics and context of conversations about you, your competition, and your niche. This incredibly useful knowledge can tell you, for example, who your customers see as your closest competition, what they’re sharing in relation to your product, their concerns, etc. This is one of the most important and insightful qualitative measurements you can use. Ultimately, Figure out what you want to track, where you can track it, think about both current customers and new customers, and go do it.